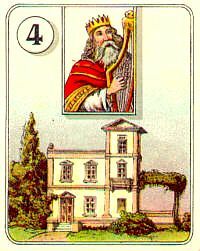 A card in this position illuminates the present moment or the question at hand. Meaning: Barriers fall and events move quickly. Urgent messages of a positive nature come your way. You may take a journey, possibly by air. Meaning: A deep stirring within the self. A subtle but powerful connection with the collective unconscious or world soul. An inspired state of being. Surges of wisdom that benefit any creative endeavor, artistic, esoteric, or scientific. Weekend Card to Contemplate for November 18 - 20. The House means you will be successful in all your undertakings. Even if your condition is an unfortunate one, you may expect a great change in the future. Meaning: Difficulties within a relationship have led to unspoken resentments and a lack of emotional fulfillment. You are bored and dissatisfied with your life. You need to re-examine your lifestyle - what it is that you want and how you can achieve it.